It’s perhaps surprising that almost 100 years since women were first given the right to vote in the United Kingdom, the story of the women who helped to win the right has never before been put to film. This has been rectified now in this effort directed by Sarah Gavron from a script by Abi Morgan, but despite an excellent cast led by Carey Mulligan, this retelling of their fight is relatively dull and lacks the spark to make their story into truly compelling cinema. Instead of focusing on one of the famous names from the suffragette movement such as Emmeline Pankhurst or Emily Davison (although both do appear), the film’s centre is Maud Watts (Mulligan), a working class woman drawn into the movement by a co-worker. The film shows us the actions of the movement through the eyes of Maud, and the events that she witness help to explain her growth from a quiet family woman into one of the most militant. Maud’s growth is developed well through a strong performance from Mulligan and a good handle on the material which touches on the main beats of the suffrage movement as their actions escalate after earlier, peaceful attempts failed. The group that Maud moves around with includes Emily Davison (Natalie Press) alongside a host of fictional suffragettes led by Helena Bonham Carter. 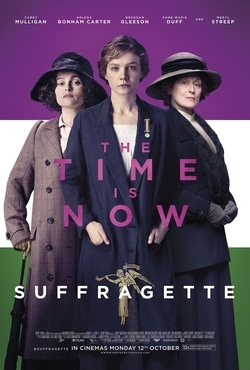 Heavily used in the promotional material, Meryl Streep’s turn as Emmeline Pankhurst is little more than a cameo. The film shows Maud’s growth within the suffrage movement, but it also shows how this negatively impacts her family life with Sonny (Ben Whishaw) and her young son, which often strives for melodrama where something subtler would have been better. The narrative hits the main beats of the suffragette movement and at times it does achieve great power as we see peaceful efforts being ignored and women being badly mistreated, but at times the film can be hamfisted and lacking in nuance. As the actions of the group intensify, the film builds to a rapid pace and the final half hour is tense and exciting, culminating at the Epsom Derby in 1913 with the moment that truly changed the narrative. Overall, ‘Suffragette’ is a good showcase for a superb Carey Mulligan performance but ultimately this film doesn’t do justice to the movement it is trying to portray.